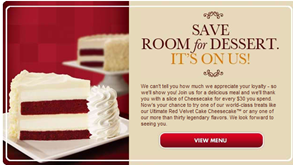 Get free cheesecake from The Cheesecake Factory. You can get one free slice for every $30 you spend. Offer is valid Sunday through Thursday from now until June 28th.